This session has openings. Registration for this session will end on 6/3/2019 at 5:00 PM. This camping session is designed for riders who have completed our Horseback I PLUS camp or have equivalent experience. 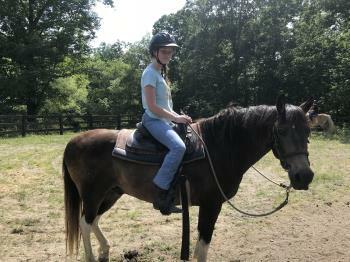 Campers will form a unique bond with their horse and improve upon their riding skills in the ring and on the trail. Camp Lookout campers choose their camp activities for the daily activity time blocks. Campers are eligible for grade level activities based on their grade entering the fall of 2019, plus all earlier grade level activities. Please note that there are more activities than can possibly be completed in a session of camp. Time, availability, and weather are all factors affecting the actual camp activity experience. Horseback II Camp (Grades 9-12) begins Monday 9:00 – 10:00 a.m. and ends Friday with a 2:00 p.m. closing. $45.00 per camper. Campers can check in on Sunday evening at 7pm. An evening snack and breakfast are provided. Campers in the following sessions are not eligible for the early check-in program: A Taste of Camp, Junior High Service Week, and Celebration Camp.